TAMPA, Florida, March 12, 2018 /PRNewswire/ — Everyone is invited to help Xbox celebrate the launch of their biggest new IP of the year, Sea of Thieves, a new shared-world adventure game that provides freedom, action and excitement creating the quintessential pirate experience. Witness history as Xbox tries to break a GUINNESS WORLD RECORDS title with Sea of Thieves Human Cannonball Launch. On Tuesday, March 13 at 1 p.m. 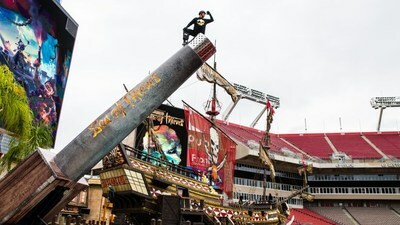 ET, David “The Bullet” Smith will attempt to break the GUINNESS WORLD RECORDS title for the Greatest Distance Travelled as a Human Cannonball using the Xbox Pirate Blaster, a 12,000 lb., 34 foot long cannon that will accelerate David from 0 to about 60 mph in one-fifth of a second. To accomplish this, David will blast off at upwards of 10 g’s average takeoff force accelerating up the cannon’s barrel. He will attempt a 200ft cannon shot before a 12g impact stop on the landing airbag. In Sea of Thieves, cannons are efficient at blowing holes in rival ships (and make for efficient ways to get on land). Fans are encouraged to tune in to this unique and interactive livestream experience on the Mixer Xbox Channel, where you can use sparks, Mixer’s site-wide currency earned while viewing and streaming games, to help light up Smith’s cannon. Make sure to tune in tomorrow, March 13 at 1 p.m. ET on Mixer to witness a GUINNESS WORLD RECORDS title attempt live and stay tuned to Xbox Wire for the results. For other incredible records on gaming, check out Guinness World Records 2018: Gamer’s Edition. Also, don’t forget to pick up your copy of Sea of Thieves, available for pre-order today in the Microsoft Store or play with Xbox Game Pass on Tuesday, March 20. The game will be available on Xbox One and Windows 10 PC.